How did you hear about UK Coffee Week? To help run UK Coffee Week we ask for a registration fee per outlet. Marketing materials will be sent to all participating stores. Please select the kit size you require. If you have more than one store you will be able to enter additional addresses and kit requirements in the next section. Kits are no additional cost. What size kit do you need? 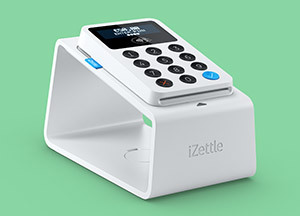 iZettle is offering 100 businesses the chance to use their Fundraising Kit (an iPad, iZettle Reader and iZettle charging dock) free of charge to accept contactless donations during UK Coffee Week. Your customers can tap their contactless card or wearable on your iZettle Reader to donate to Project Waterfall in seconds (you can set the donation amount using iZettle’s Repeat Payments feature). *Offer available while stock lasts and not guaranteed. You will need a strong wifi connection, flat surface on your shop counter to place the iZettle Reader, and power plug nearby for charging the iZettle Reader. You would be set up with an individual iZettle account connected to a central UK Coffee Week account that collects all donations. Kit delivered by Friday 26 April and collected on Monday 6 May. 100% of the funds you raise during UK Coffee Week go directly to Project Waterfall, bringing clean drinking water to coffee growing communities in our ongoing project in the rural Jabi Tehran district of Ethiopia. Enter your fundraising target below and we’ll do our best to help you achieve it! During UK Coffee Week 2019 we're aiming to raise £ which will change 0 lives by providing a sustainable source of clean drinking water and sanitation. Recommend a Friend? The more businesses and coffee lovers who participate in UK Coffee Week, the more money we’ll raise for Project Waterfall. Know any coffee shops or retailers who should be taking part? Tell us below and we’ll get in touch with them!